EXCLUSIVE: The EU is failing to create a circular economy that boosts resource efficiency and protects the environment, an influential report has found, piling pressure on the European Commission to deliver a strong replacement for the package of waste, incineration, landfill and recycling laws it controversially axed as part of its drive for “better regulation”. The European Environment State and Outlook 2015 report will inform the next five years of EU policymaking and is written by the European Environment Agency (EEA). The Circular Economy package of six laws on waste, packaging, landfill, end-of-life vehicles, batteries and accumulators, and electronic equipment waste. was quietly ditched last week after a meeting of the College of Commissioners. Commission Vice-President Frans Timmermans, in charge of better regulation, has promised a “more ambitious” version of the bill will be proposed before the end of this year. Today (3 March), campaigners and Hans Bruyninckx, the EEA’s executive director, said the report put the onus on the Commission to deliver an improved bill. “So we are looking forward to seeing the strengthened packages,” he added. Jeremy Wates, the European Environmental Bureau’s secretary general, said: “This scandal can only be mitigated if the Commission now comes forward with a proposal that is genuinely ambitious”. That would mean keeping waste targets from the original proposal and adding measures to make products more repairable and longer lasting, he added. The dropped Circular Economy package included legally binding targets of 70% recycling for municipal waste by 2030, 80% recycling for packaging, such as glass, paper, metal and plastic by 2030, and a ban on landfilling of all recyclable and biodegradable waste by 2025. The EU has a goal of “living well within the limits of the planet” by 2050 in its 7th Environment Action Programme. But current policy was not ambitious enough to meet that, or other long-term environmental goals, the EEA said in their five-yearly report. Neither the environmental policies currently in place, nor economic and technology-driven efficiency gains, will be sufficient, the EEA said. Biodiversity loss and climate change remained major threats. Efficiency improvements were often negated by rising consumption, the research found. Food, energy, housing, transport, finance, health and education systems had to be transformed. Bruyninckx said EU policies had successfully tackled environmental problems over the years, but massive changes to the systems of production and consumption were needed. “We will have to fundamentally rethink how we live on this planet with nine to ten billion people, that all have an equal right to a decent life,” he told EURACTIV. “It is quite clear that we cannot continue in our linear model of getting resources out of the ground and in the end, throwing them away”. The report will be presented by the EEA boss and European Commissioner for Environment, Maritime Affairs and Fisheries Karmenu Vella, in Brussels today (3 March). The notion of the “circular economy” where nothing is wasted is central to EU efforts to boost resource efficiency, the report said. 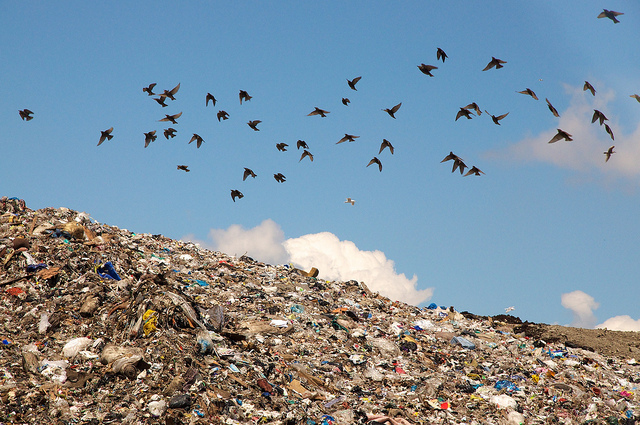 Waste management had improved, but “Europe remains far from a circular economy”, it added. The EU has introduced waste policies and targets since the 1990s. They included measures for specific types of waste, moving towards the broader Waste Framework Directive. The directive, a 2008 precursor to the Circular Economy package, works on the basis of a waste hierarchy. The hierarchy prioritises prevention, followed by preparation for reuse, recycling, recovery and finally disposal as the least desirable option. According to the report, European trends in waste management were largely positive. Per capita waste generation (excluding mineral waste) across the EU dropped by 7% to 1,817 kg per person, between 2004-2012. Municipal waste declined by 4%, to 481 kg per capita, over the same period. Between 2004 and 2012, the EU-28, Iceland and Norway reduced wasted in landfills from 31% of total waste generated to 22% (excluding mineral, combustion, animal and vegetable wastes). This was partly due to increased recycling rates of municipal waste, from 28% in 2004 to 36% in 2012. Reduced methane emissions from landfill and avoided emissions through recycling also contributed to a drop in greenhouse gas emissions. But, the report said, waste generation remained substantial and policy target performance was mixed. Many EU members would have to make “an extraordinary effort” to hit the EU target of 50% recycling of municipal waste streams by 2020. “Waste management will need to change radically in order to phase out completely the landfilling of recyclable or recoverable waste,” the report said. Drawn up under the last Barroso Commission, the package was the highest profile pending bill to be dropped, as part of the Juncker administration’s drive for “better regulation”. It was intended to increase recycling levels and tighten rules on incineration and landfill. Barroso’s administration claimed it would create €600 billion net savings, two million jobs and deliver 1% GDP growth. EU environment ministers, MEPs and campaigners argued strongly against the decision. Dropping it would cause unnecessary delays and send the wrong message, they said. The withdrawal is even more controversial as a business organisation had lobbied for the package to be killed off. Timmermans has asked Green MEPs to trust him over the decision. He said the new bill would include laws to prevent waste being created in the first place. This can be achieved by “completing the circle”. This would involve legislating to encourage the use of materials that create less waste and are easy to recycle, he said. European Commissioner for the Environment, Maritime Affairs and Fisheries Karmenu Vella said,"I see the State of the Environment Report 2015 as the 'starting line' of my mandate. The report clearly shows that EU environmental policies are delivering benefits. Environmental policies are also delivering jobs. The rapid growth of the green economy even during the worst years of the recession bodes well for Europe's competitiveness. "We must stay ever vigilant to ensure that good policy, well implemented, means excellent environmental results both on land and at sea. Innovative investment to safeguard prosperity and quality of life are a priority. The long-term investment we make today can ensure that in 2050 we live well, and within the limits of the planet." Ariel Brunner, head of EU policy at BirdLife Europe, said, "We hope that today’s report marks a new dawn and that the Commission will now up its game in terms of environmental ambition. President Juncker has started on the wrong foot, with the environment left out of its political guidelines and downgraded in its structure, and its first actions have been entirely focused on deregulation. European citizens desperately need a healthy environment, thriving nature and the prosperous green economy that can deliver both." "The report sounds the alarm in particular about the dramatic loss of grassland biodiversity. This shows the consistent failure of the CAP to reward the delivery of public goods by farmers, an inexcusable lack of enforcement of the Birds and Habitats Directives in the farming sector and the nefarious consequences of Europe’s perverse subsidies to energy crops for biofuels and biogas". Tony Long, director of WWF European Policy Office, said, "This is a wakeup call for the Commission. The 2015 State of Europe’s Environment is just the latest in a line of warnings that if the Commission wants to be 'big on the big things', as President Juncker says, then it has got to start giving environmental policy much greater importance in its priorities. Every five years the European Environment Agency, an independent EU agency, publishes its report, The European Environment State and Outlook. The 2015 edition is made up of two reports and 87 online briefings and will inform European environmental policy between 2015 and 2020. The EEA aims to support sustainable development by providing information to policymakers and the public. The Circular Economy package was intended to increase recycling levels and tighten rules on incineration and landfill. It consists of six bills on waste, packaging, landfill, end of life vehicles, batteries and accumulators, and waste electronic equipment. Commission First Vice-President Frans Timmermans was given a mandate from new Commission President Jean-Claude Juncker to cut red tape and deliver “better regulation”. He said the package would be withdrawn and re-tabled by the end of 2015. 3 March: European Commissioner for Environment, Maritime Affairs and Fisheries Karmenu Vella press conference to launch EEA report. By end of 2015: End of year deadline for re-tabled Circular Economy package. CETAgreement & Global Treaties/’Arrangements’; Suing the Global Corporate Economy. How Many Preferred Shares of TPP, CETA, TTIP, et al, Generated Enterprises are You Selling your Right to Sue the Global Corporate Economy for? ‘New’ Shareholders Can Say ‘NO’ to & Over-Rule CETA, TTIP, et al, Plans? TPP, CETA, TTIP, Global Treaties; Corporate ‘USA’ & SHAREHOLDERS Secretly Using Tax Dollars to Implement SECRET Suing Machine to HAMMER Non Shareholders. Time to Re-Set ‘Game’? Will corp.’USA’ et al, & Feds to Prepay $Billions for All ‘Trade’ Treaty/’Arrangements’, et al, Secret (‘Death-Star-Chamber) Tribunals’ Punitive Damages to Protect Home Territory’s Taxpayers? Other Territories, Municipalities, et al, “…(we) need to control corp. USA’s ‘Contributions'”. Undemocratic, Higher Taxes & More Cuts to Services to Pay Secret Penalties; NON Shareholders Have to Pay corporates USA, Japan, Australia, Germany, Canada, et al, & their SHAREHOLDERS. But, If Not PUTIN; ‘The WHITE KNIGHT’, then Who Do YOU Want to Bankroll the Saving the harmless NON shareholders of the World from Fast Tracking TPP’s, CETA’s (TTIP) Secret ‘Death-Star-Chamber’ Tribunal Penalties? How about Warren Buffett, et al? who are quite interested to know if President Xi Jinping (China) will support Russia as a co-member of B.R.I.C.S. when President Putin uses his potential role as ‘The White Knight’. Have the federal representatives of the nations that are the potential signatories of TPP, TTIP, et al, willingly provided the NON shareholders of US, Canada, Europe, the Trans Pacific nations, et al, with the aforementioned information? Are the federal representatives, et al, depriving the NON shareholders of Canada, et al, of the due diligence information that enables the family of the NON shareholders of Canada, et al, to make informed decisions regarding their financial planning? 3) use to do their cyber banking, accounting, ‘taxation’, etc. And, re; the CHINA – Canada Investment Treaty (C-CIT), et al, is it understandable why the ‘coveted’ Hong Kong investor & his associates are ‘concerned’ with the aforementioned findings of The SUPREME COURT of CANADA, et al, & the effects of the potential findings, et al, on the EU, AMERICA, the Trans Pacific nations, et al, treaties with CHINA, et al? In regard to arms sales (and other ‘contentious’ products & services & investors, repatriating profits, et al) ; how about the sale of arms (non nuclear) in general in regard to the ‘trade’ treaties that are continuing to be secretly negotiated and how will the Tribunals, both; B.R.I.C.S. & non BRICS, adjudicate, decide & penalize the NON SHAREHOLDERS for the sale of legitimate, semi- legitimate & ‘illegal’ sales of arms within the signatories nations & the those of others, &/or, unaligned? Of particular, interest is China, which does have an treaty with Canada, which puts China ‘at odds’ with other arms manufacturing & nuclear powers that it (China) does not have any ‘arrangements’ with. Are these types of questions that your politicians & the corporate lobbyists calls ‘forget-me-nots’ (‘Buyer Beware’) that will be (maybe) worked out after the fast tracked signatures are obtained? And, what do you think is the significance of the line in The Submission to The Supreme Court of Canada ‘…And, lest one forgets that the revelation of the present perilous international treaties/’arrangements’ began with the regard for the rights of Native Canadians as per the Treaties/’arrangements’ that corporate Canada & the Government of Canada have ‘foisted’ upon Native Canadians…’? What are the various ways that this line will cost the SHAREHOLDERS, et al? Vice-President Frans Timmermans, in charge of better regulation, has promised to recycle gun-toting song-bird shooting Italians – he said they would be humanely put down and then composed in an environmentally friendly fashion – their clothes would be given to poor people and their guns turned into plough shares.